The last couple of years some of the pros have been dropping strong hints that it probably wasn't very fair for me to be in the amateur category. They were correct, but until last year I wasn't budging until they made me. 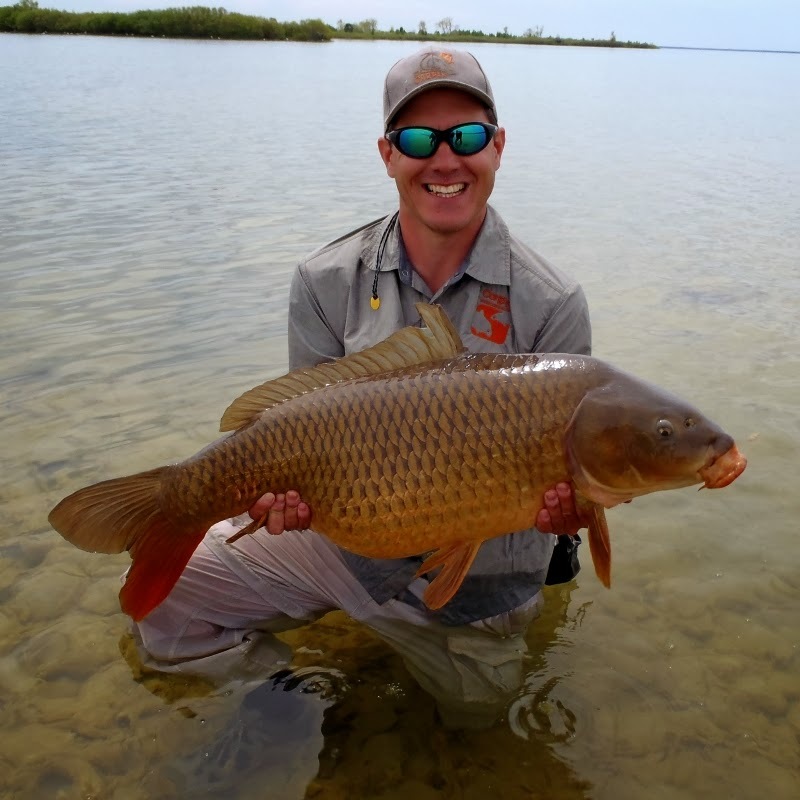 To be honest, I actually found it hilarious that I was a total ringer, and I wasn't sure I was ready to teach fly fishing for carp. 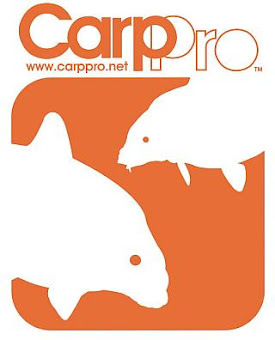 You see, Carp Slam is a pro-am tournament where 15 "pros" get randomly paired with 15 "amateurs". The basic guideline is that if you have never guided for money you are an amateur and it is that way for good reason. The whole intent of the competition isn't actually to have a competition. The actual goal is to have a fun framework in which to raise money and awareness to benefit the river. 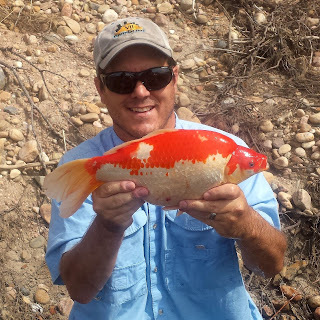 By having the pros teach the amateurs you develop more anglers with the necessary skills to go out on their own and develop an emotional connection to the resource. In that context it becomes more important that the pro be a good teacher and ambassador for the sport than a good carper. Well, after last year I finally decided that it was ridiculous to be in the amateur category and asked to be moved to the pro category. I am so glad I did. For the past three years I have felt intense pressure to live up to my ringer status. I think in those three years I managed a grand total of 1 hour of sleep the night before the slam. This year I slept like a baby. 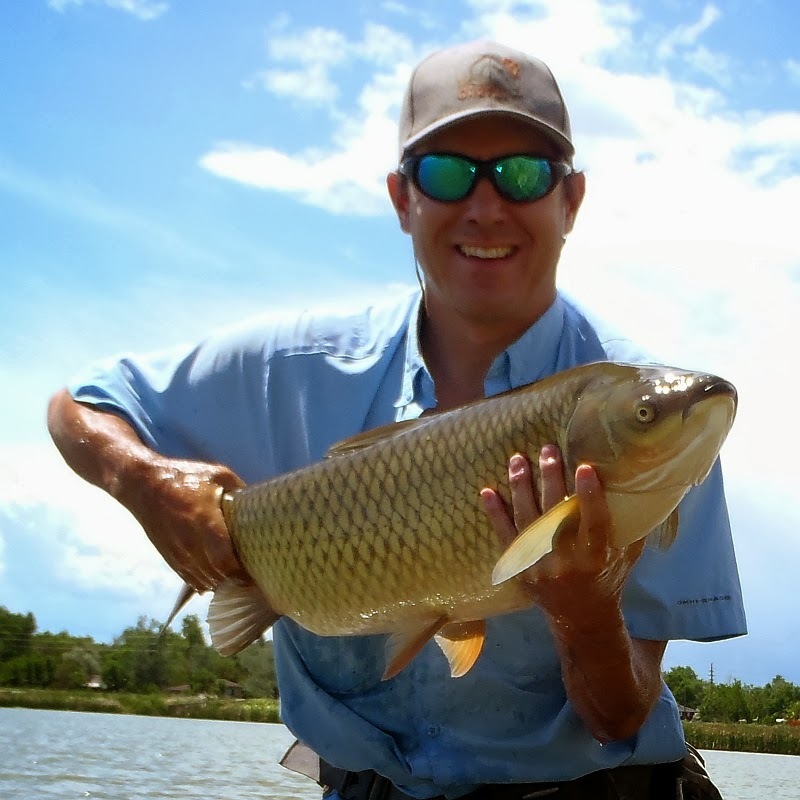 I felt like even if we didn't win, and even if we didn't have good shots or good beats, my partner would walk away with a new-found appreciation for the Denver South Platte River and Carp. Don't get me wrong, I like to win but in this case I just felt that it was just as, if not more, important to me that my draw partner Sam Doyle had a good time and learned a thing or two. 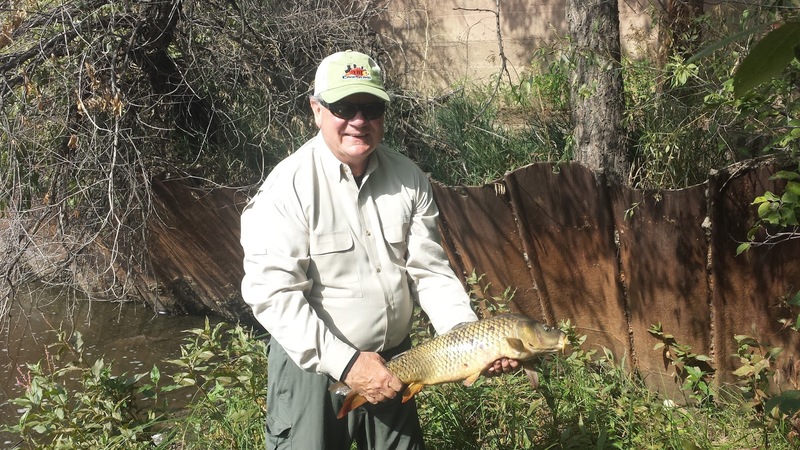 Not only was Sam a good guy and passionate about our fishing resources, but he had done an absolutely brilliant job of raising money to benefit the Denver South Platte in the amateur fundraiser competition. A ridiculously awesome job. We are talking over $5000 dollars of a good job. Well, let me tell you - that lack of pressure was GREAT for my game. I really felt like I fished great. I was absolutely NAILING presentations, I put us on as many good shots as was humanly possible given the huge drop in water temperatures the river had seen prior to the slam, and I felt like I did a great job of teaching Sam (and our controller Jim) a thing or two about carp. We did not, however, win. We had our chances. Good chances. Early in our afternoon session I hooked two above average size carp but lost them both to hook pullouts. Was my drag too tight? Maybe. Did I apply too much pressure? Maybe. Did I just get a little unlucky? I don't know. I don't know. And there you go. Sam Doyle's first carp on the fly! Mission accomplished, tournament saved. I was on absolute cloud nine. 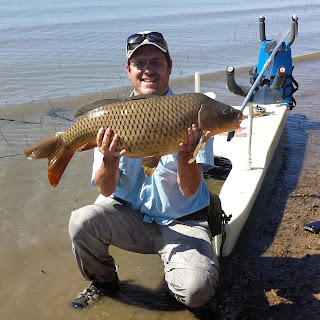 All it took was one carp for a good man to make this one of my favorite Carp Slam tournaments ever. Of course by the next morning it fully sunk in that my two lost carp plus his landed one would have gone for the win and several days of dejected depression set in. 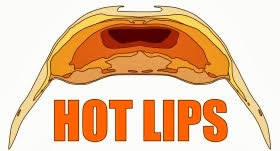 Ah what the hell, that's the carp slam for you. And yes, congratulations to the winners - Frank Smethhurst and Brett Graham and thanks to the organizers for such hard work to benefit our beloved river. Right, you have your priorities in line. Too bad about the fish lost but good for Sam! I think you would like Sam Gregg. He sure was interested in the story about Sand Creek and you calling the Denver Post to help get the ball rolling. sorry about the lost fish.. Friday's rains must have made it very difficult.. 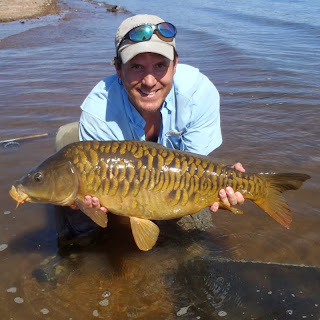 The carpslam website says on average over the years 63% of competitors don't catch a fish. 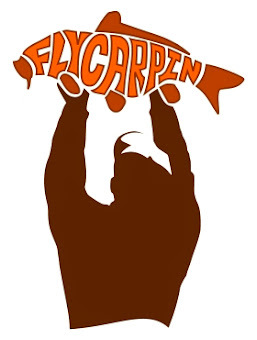 That has to be the lowest success rate of any organized freshwater fishing event..
of course flycarpin itself is probably responsible for a lot of people's first carp on a fly, too.. Sam has plenty of company.. I like to think I have helped a carper or two. I hope so at any rate!